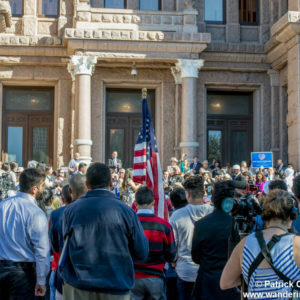 A sea of people – thousands of them – filled the steps of the Capitol and the area around, as this year’s Texas Muslim Capitol Day kicked off with a rally and press conference. Non-Muslims were there in force, verbally supporting and even physically protecting Muslims. In the wake of Trump’s so-called travel ban, supporters with welcoming signs overwhelmed the event. Supporters linked arms and surrounded the area around the podium, which was the site of an ugly confrontation at the last TMCD. This entry was posted in Legislators, Texas Muslim Capitol Day. Bookmark the permalink.